QR Codes are everywhere nowadays. They are those square barcodes composed of a static-like pattern, which you will find on contemporary advertisements, product labels, billboards, posters, ID cards, and recently, even business cards. QR Codes have become popular because they are easily scanned using a smartphone, which can instantly store or make use of the barcode data—usually contact info or a website link. In our digital age, the QR Code has been embraced as a convenient way of connecting real-world objects with the virtual realm. Designers, however, can find it tricky to incorporate the QR Code in their work. It’s not a major problem when designing something such as a poster, where the QR Code can be sidelined in a corner. It’s quite another thing when you have to apply it in the design of a business card, where there is very little space available. You can’t even alter its shape and form, like you can do with text. 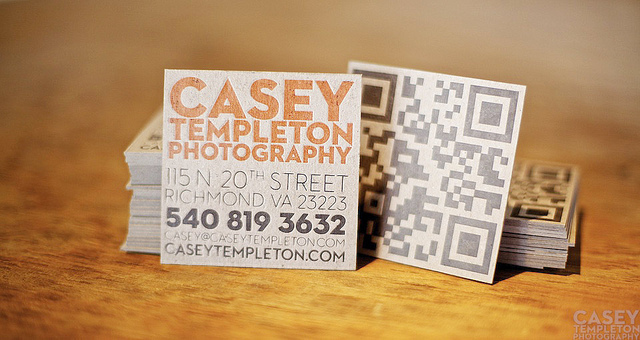 Of course, that doesn’t stop a good designer from successfully integrating the QR Code into a business card design. All over the web, you can find examples of clever designs that find a way to make use of the code as a design element. But we’re not just going to show you pictures of those business cards. We’re going to categorize the various ways designers have found of using the QR Code in business card design. Use the QR Code as the dominating element of the card layout. This has to be done with flair, or the design may come across as generic. 2. Put it at the back of the card. Sometimes that can simply be the best choice. 3. Use square as the card shape. If you’re going to put the QR Code in the card, why not make it the entire design at the back? The card will instantly stand out, just for being a square, which is not the most popular shape for a business card. And you know the trend today, the more unique the shape and design are, the better. 4. Make it as small as possible. This is one of the more obvious design options, but it’s still tricky. Even reduced in size, the QR Code will still take up significant amount of real estate on a business card. A designer must consider its placement very carefully. 5. Use a “white on black” design. Most of the QR Codes you see are black-on-white barcodes. A simple inversion of the colors can give the familiar pattern a touch of distinction. 6. Use a laser-cut design. Cut holes in the card to form the pattern of the QR Code. As long as the code still works, this technique will results in a cool card design that can make people go “wow.” It may not work for all QR Code patterns though. 7. Use compatible design elements. Select typefaces and pictorial elements that harmoniously match the blocky, static-patterned QR Code. For example, you can use large, blocky letters and shapes. It’s a risk to combine the QR Code with a background design. It’s possible that people will be unable to see the combination as anything but awkward. But those who admire it will surely applaud you (at least in their heads) for attempting such a unique and difficult endeavor. 9. Play with the code pattern. Some designers are brilliant enough to use stylistic elements within the barcode pattern itself, without affecting the QR Code’s functionality. It’s so simple! Just rotate the QR Code. It immediately appears more dynamic.